Please visit http://www.gogoboard.org for the latest version of this document. In most cases, the value you get from a sensor indicates the "resistance" of the sensor. Resistance is a very basic property of any material. Metal has extremely low resistance. Thus, they conduct electricity very well. On the other hand, plastic or rubber have very high resistance. Almost no electricity can flow though them. That is why we use them to coat electricity wires. Here is a simple rule: the higher the resistance, the higher value you will get from the GoGo board. Since air does not conduct electricity (unless you have a very high voltage), your get 1023 (the highest reading) from a sensor port without a sensor connected. It is then not hard to guess that when you get a reading of zero, it means your sensor has no resistance (like a piece of wire). There are also many sensors that change their resistance according to some particular property of the environment. Examples of these sensors include light, temperature, pressure, etc. For those who are interested in the deeper technical details, there is a 33K reference resistor on each sensor port, which is used to determine the readings you get. The figure below shows how the reference resistor is arranged. 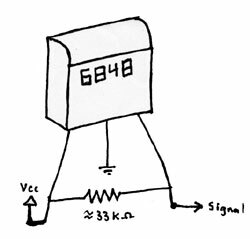 The Microcontroller measures the voltage drop across the sensor, which can be calculated from the following equation. Now, we know that if the voltage drop is 5v, we get a reading of 1023. We can use the same equation to determine the sensor readings directly. The GoGo board has eight sensor ports. Each of them has three pins, as shown in the illustration below. Rows one and two (Ground and Sensor Input) are the ones most simple sensors use. Row three is an extra power supply for active sensors that needs a power source to function properly. Sensors that have been mentioned so far are called passive sensors. They do not need separate power to operate. Active sensors, on the other hand, are sensors that need their own power. An easy way to distinguish active sensors from passive ones is to count the number of pins it has. Active sensors have an extra third pin to get the power it needs while passive sensors have only two. Active sensors are more complex, but they open up a broad range of sensing possibilities. Examples of active sensors include Infrared sensors [it detects presence, distance], Hall effect sensors [detects magnetic field], noise sensors, vibration sensors, etc. Here you will see how to make three passive sensors: touch, light, and temperature. All passive sensors only need two pins (pin 1 and 2 ). Touch sensors are one of the simplest sensors but yet they are most useful. 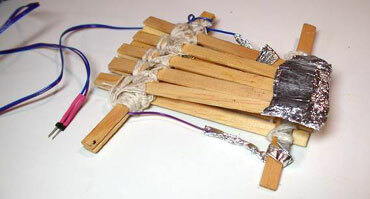 The general ideas is very simple: you have two conductive objects that would touch each other when activated (i.e. pressed, stepped on) or vise versa. Here are some examples of touch sensors. This is probably the easiest way to make a touch sensor. You attach some aluminum foil to two pieces of paper that are folded in a way that will make the foil touch when pressed. You then connect one lead to each foil. 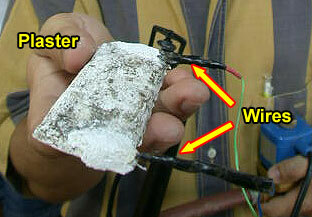 You can, of course, replace aluminum foil with other conductive elements (i.e. paper clips or nails). Ice-cream sticks and aluminum foil. Ice-cream sticks are excellent for making simple structures. It is stronger than paper. Therefor, when used with aluminum foil, we can make touch sensors that are much more rigid. The following picture shows one example. 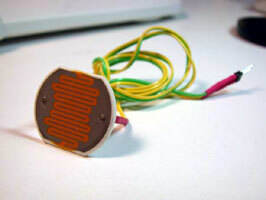 Making this type of sensor you need two conductive contacts sandwiching a non-conductive material. Overhead transparency films are nice as they are flexible. You can stick or glue aluminum foil to them and use two of them to sandwich a piece of cardboard paper. You punch holes in the cardboard allowing the foils to touch when pressed. You can also buy switches from electronic stores and attach them to the GoGo board. These switches come in many shapes and sizes. The most common ones are lever switches and push buttons. 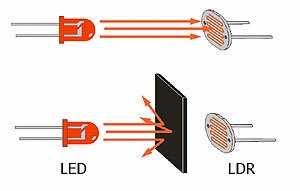 The most common light sensor is called LDR (Light Dependant Resistor). They are also known as "Photo cells." 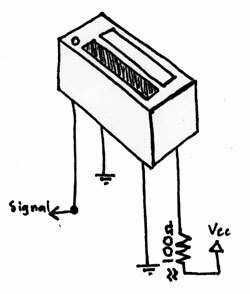 A LDR is basically a resistor that changes its resistance when light intensity changes. You often see them in automatic light stands. Since LDRs are simply resistors, you can just simply connect the two pins from the sensor to the GoGo board. You can simply connect two wires or paper clips to pins 1 and 2 of the GoGo board to measure humidity in the soil. When the soil gets moist, it conducts more electricity. Thus, the sensor readings you get will change as the soil humidity changes. This same idea can be used to make a water detector sensor. When the two wires touch water, the sensor readings will change. 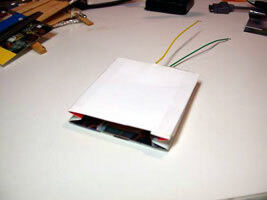 You can improve the humidity sensor by connecting the two wires to a piece of gypsum, plaster, or any other material that absorbs water. The idea is still the same but you are improving the purity of the conductive medium. The sensor's behavior will not change too much from one place to another. Gypsum is the material they use to make building interiors (ceilings, walls, etc). Plaster is also used to cover walls and to make a patient's cast. 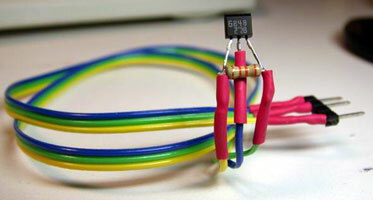 To make a temperature sensor, you will need to find a thermistor. Some thermistors are simply resistors that changes their resistance as temperature changes. Other thermistors are active sensors that need extra power to function. Here are examples of useful active sensors. This type of sensor is useful when you want to detect object presence without touching it. For example, you want to detect when someone walks through a door, or when someone's hand gets too close. A simple idea for this sensor is to beam light on to a LDR (light sensor). If something passes by, it blocks the light and the LDR detects it. If the light source is a light bulb, then you are simply detecting shadows. If you use a laser pointer as you light source, you detection range can be very far and you readings will be very precise. There is another idea to accomplish the same task. You can beam light outwards and measure the amount of light that is reflected back. When there is nothing to block the light, the reflected light will be very small. However, if an object blocks the light, it reflects more the light back. This is what we call a reflective light sensor. The benefit of this kind of sensor is that the sensor is located all in one place and no alignment is needed when you change the direction of the sensor. 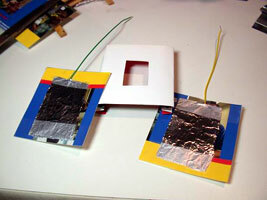 You can make reflective sensors simply with an LED and an LDR. You need to use a bright LED. This works but the detection range will be limited (less than 1 inch). There can also be a lot of interferences from external light sources as well. Here is a schematic of how this sensor can be built for the GoGo board. The resistor is there to limit the current that goes through the LED. The smaller the resistor value the brighter the LED. 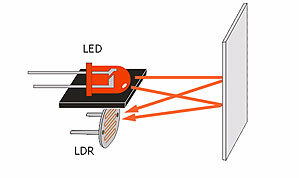 A better version of the above reflective sensor is to use Infrared light (IR), as there is much less interferences. IR is a kind of light that humans cannot see. This is nice when you do not want people to see your sensor (i.e. in security systems). 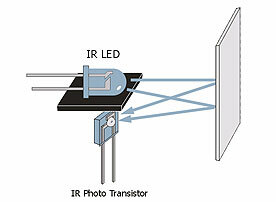 Notice in the diagram that we use an IR phototransistor instead of the LDR. In this case, the two functions the same way, but the IR phototransistor is much more sensitive to IR light than an LDR. 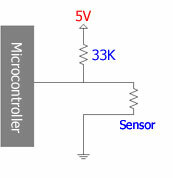 The following is a schematic of how to build this sensor. You can also buy commercial IR reflective sensors as well. They normally come in a compact size and the sensor readings are more reliable. 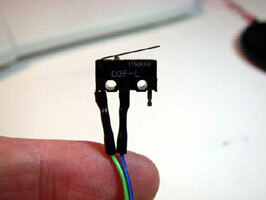 Here is an example of how to assemble a commercial IR reflective sensor (digikey.com partnumber QRD1114-ND). You can use this sensor to detect the presence of magnets. The applications are similar to the IR reflective sensor but they do not depend on light, which often means they are more reliable. However, you need to have a magnet while light is almost everywhere. www.radioshack.com - website of the famous electronics retail store. 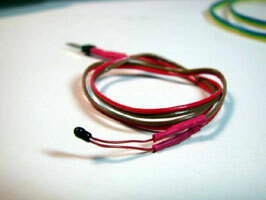 www.allelectronics.com - This site has a huge collection of low-cost electronics parts. If price is your biggest concern, this is where to go. www.digikey.com - This is one of the largest on-line electronic store on the Internet. Building Sensors and Motors for the Red and Blue Dot Cricket. Fred Martin wrote very nice documentation explaining how to make sensors for the crickets. Many sensors used with the GoGo board are inspired by his work.